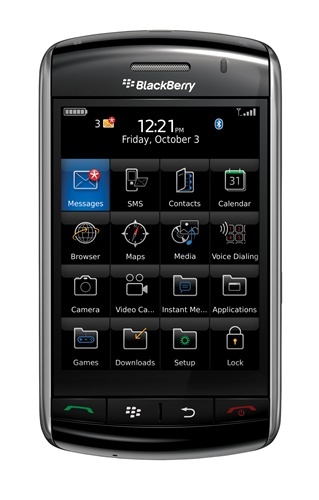 With the BlackBerry Storm, select and type using touch technology; the screen is the keyboard. Unique pressure sensitive screen lets you touch the screen to select items, whilst a physical press activates them. Typing is easy too, highlight the letter on the touch screen and press the screen to make it appear in your message or document. And navigation is a breeze. Like a mouse, your fingertip moves the cursor across the screen. Use your time better with the BlackBerry Storm. 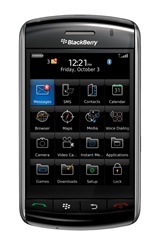 The fast 528 MHz process lets the BlackBerry Storm 9500 handle even the most complex tasks instantly, without slowdown. 3G support with HSDPA lets you access voice and data services simultaneously. Download an email, access information on a website and discuss it with your colleagues on the phone, all at once. Use the 3.2 mega-pixel camera to take sharp print quality photographs in an instant. The auto-focus feature makes sure shots are clear and sharp, whilst the auto flash takes care of poor lighting conditions seamlessly. 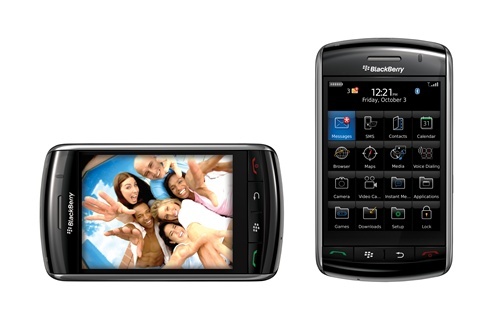 Use the BlackBerry Storm's built in media play to unwind and relax. MediaSync software lets you sync your DRM free iTunes music to your BlackBerry Storm. Use the 1GB of on board memory, or the microSDHC memory card slot to carry an entire library of music, photo's and movies in your pocket. A 3.5mm headphone socket lets you plug in your favourite headphones. Use the BlackBerry Storm's built in GPS & BlackBerry Maps software to help you find your way. The large display shows maps with exceptional detail and clarity.